David North is a fellow at the Center for Immigration Studies. He is grateful to Jesica Ray for her research assistance. There are many ways to fraudulently secure legal alien status in the United States, but one technique is much more unattractive than others. Getting a green card illegitimately is, of course, a crime, and every time it happens we add one more member to America's criminal population. Every time it happens it creates yet another burden on the general public. But with one of these criminal avenues there is yet an additional factor — a U.S. citizen (or less commonly, a green card holder) is misled by someone he or she loves, and that person often suffers severe emotional and financial damage. The Center for Immigration Studies is beginning to gather some more data on this ugly process. 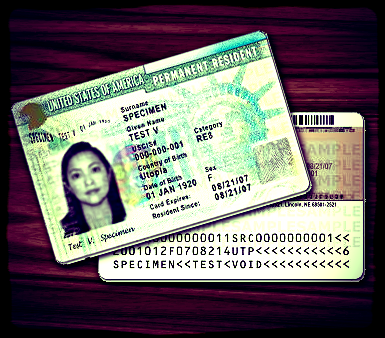 We are describing what happens when an alien marries a citizen (or green card holder) for no reason other than to obtain legal status in the United States; typically the alien waits until a federal form is filed by the trusting spouse seeking legal status for the alien and then the alien deserts the citizen, charges that the citizen abused the alien, and then (this may be unique to the United States) the alien "self-petitions" for legal status on the grounds of the abuse — and usually gets it. All of this is facilitated by provisions in the Violence Against Women Act (VAWA), which allow alien spouses who claim they were abused by their resident spouses to file for green cards as immediate relatives; the government does not notify their spouses of these applications. This puts the alien on a clear path to permanent resident alien status as an "immediate relative" of a citizen; it takes a little longer if the alleged abuser is a green card holder. Immediate relatives can obtain immigration visas without consideration of any numerical ceilings. Clearly there are some cases in which an alien is lured into an unsatisfactory marriage by a citizen or green card holder and in some cases (given the size of the caseload) there must be real instances of abuse by U.S. residents. Logic would suggest, however, that the incidence of such marriages and such abuse would be more or less steady absent fraud, just as deaths by lightning reports are nationwide.1 However, the data would make it appear that that's not the case. A continuing pattern of the government's unwillingness to take appropriate steps to sort out the genuine cases of abuse from the fraudulent ones. We have strong suspicions (for reasons explained below) that many, probably most, of the 8,366 (or 8,367) remaining 2014 beneficiaries — the adjustees —were in illegal status here in the States when they filed for status. These complaints, usually from men in the cases directly known to the Center, were unanimous in one respect — all of them said that when they complained to the Department of Homeland Security they got only routine acknowledgments and never were able to testify to the government about their side of the case. Their stories were that government went ahead and made a decision on the matter without consulting them or even informing them of the result. These breakups, we were told, sometimes in searing detail, were painful to the citizens and, because of the legal fees often involved, led them into financial as well as emotional straits. DHS, incidentally, as part of its pattern of making immigration decisions on paper, as opposed to the earlier practice of talking to applicants, sends all the applications for these abused spousal benefits off to one of its isolated decision factories, in this case the Vermont Service Center (VSC). The VSC also handles many other kinds of visa applications. With this partial but worrisome information in mind, we at the Center decided to seek further data on the subject. What could government files available to us tell us about these decision-making processes? What could we learn about the population of applicants for abused spouse status? Where did they come from and what stories (real or imagined) did they tell? How many were men and how many were women? The only source of governmental information, untapped by us, seems to be the file of decisions made on appeals from denied applications for abused spouse status. An alien whose application is denied by the Vermont Service Center has the option of appealing that decision to the in-house DHS appeals entity, the Administrative Appeals Office (AAO). VSC decisions either in favor of the applicant, or negative but not appealed remain secret. 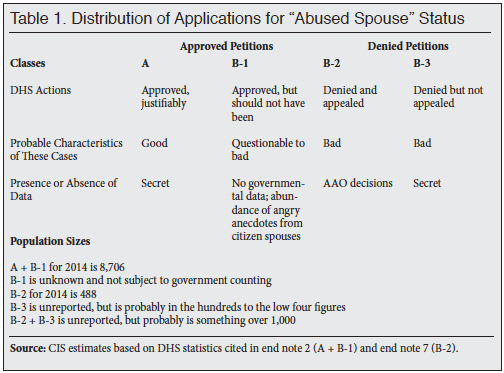 There are hundreds of appeals from denied abuse decisions each year (but thousands of approvals) and we examined a 6 percent sample of the resulting AAO decisions to see what we could find. Before going into our findings, it would be helpful to show how this particular group of people, those with denied and appealed decisions, fits into the larger picture of the self-petitioning spouse applicant population. All self-petitioning "abused" alien spouse applicants (using form I-360) are divided into two major segments, those whose petitions have been approved and those whose petitions were denied by the VSC staff. We then divided each of those major groupings into two more sub-groupings, as shown in Table 1. Clearly the population of major interest to policy makers is B-1 (applicants who were approved, but should not have been). These are the cases in which DHS has ruled that the spouse is in fact married to the citizen (or green card holder in some cases) and is, in fact, abused, but the government should have ruled that the alien is a fraudulent applicant. But since there is no direct information on this population, perhaps looking at the characteristics of a similar, known population, B-2, will give us some clues on the B-1s. That was our premise. Exploring a sample of the AAO decisions about population B-2 is useful, then, for two reasons: It should give us insights into the staff decisions about eligibility for the program and it should tell us something of the demographics of the B-2 population, and the techniques that they had used in their schemes. Our suspicion is that the characteristics of people in B-2 are similar to those in B-3, and probably quite similar to those in B-1. As we began the process we had four assumptions: First, that since the big majority of individual complaints we had heard were from men, the majority of the aliens appealing would be women. Second, because a citizen or green card marriage to an alien can lead to legal status only if the alien arrives in the United States with a visa, we assumed that there would be relatively low participation of people from Mexico and Central America, most of whom enter without inspection. Third, we expected, given an earlier exploration of these files, that there would be a lot of missing information, such as on the gender of the appellants or the nation of origin. Finally, given the general trend of AAO decisions over a long list of sub-programs, we assumed that here, too, most of the decisions would be against the appellants. Most of these expectations were realized. The most significant finding was a negative: We saw no evidence that the staff had ever talked with the spouse of an alien applicant. None. Sometimes the AAO decisions report that staff found a criminal report, or a lack of a prior divorce, or a self-admitted bribe, or the results of one of those USCIS simultaneous interviews of spouse and spouse, but we never saw a case in which the testimony of the allegedly abusing spouse was discussed.8 It is a little like running a traffic court in which the driver is never allowed to say anything. The AAO judges focused, as far as we could see, on this question: Did the applicant make a good enough case for the benefit sought? So the narrative ability of the alien or that of the alien's lawyer becomes a de facto key variable. As so often is the case in immigration law enforcement, in marginal cases the skillful skate through and the klutzy are caught. By definition, those falling into Population B-1 are in the skilled (or lucky) category, and those in populations B-2 and B-3 fall into the unskilled and unlucky group. This is not to suggest that some genuinely eligible aliens are not in the A category. Similarly, we are sure that many in the B-2 and B-3 categories are there because the VSC staff noticed, appropriately, that they were truly ineligible. Our sense is that if the "abusing spouses" were allowed to participate in the process, the number of people in the B-1 population would shrink (and that of B-2 and of B-3 would rise.) Creating a process at this level of openness, of course, would be time consuming and awkward, but so are the judicial processes involving divorce, and divorces are not settled in secret with only one of the participants being heard. What we may have in this program is the opposite of the tilt of most of society; usually it is the male who is predominant and usually citizens have more rights than aliens. In this program both of those generalizations seem to be reversed. In USCIS as a whole something like 95 percent of all decisions, on all petitions, are in favor of the alien. Only denials are appealed, and since it seems that only the most egregious cases are denied, when they are appealed to AAO, most of the denials are upheld by the anonymous AAO decision-makers. Most of these are presumably career DHS adjudicators; they need not be lawyers. As shown above, this general tendency seems to prevail with the abused spouse cases; the overwhelming majority of the staff denials were confirmed. Remands are not necessarily good news for the aliens; sometimes they instruct the staff to review part or all of the existing decision to cover a point that has been missed; sometimes they are simply an instruction to the staff to deny the case for a different reason than offered below. There were just three reversals and in all three cases the alien was a woman. The two moot cases are intriguing; in one a male alien, from an unidentified country, married a citizen and claimed that she abused him. The staff rejected his application and he appealed. But by the time that the case came before AAO he had married another American and she had successfully filed for his legal status, so AAO, appropriately, called it a moot case. If at first you do not succeed, try, try again! The rejection of the first immediate relative petition by USCIS apparently did not block the approval of the second one. The other moot case noted that the female appellant had received, in an unspecified way, a green card, but was in the process of being deported, for unstated reasons. Most of the cases involved a lawyer, though these were of uneven quality; there were 13 cases in which the alien was self-represented. In one of the latter, the alien secured a reversal of the staff denial. Most of the cases were initial appeals, but 10 of them were attempts to turn around an earlier AAO decision. In one it was clear that the case was now on the third round of litigation. Only a handful of these cases involved a person from a Muslim nation; in one of them, a male from Pakistan tried to argue that he had been subjected to serious abuse because he felt he could not bring his friends to the house where he lived with his wife and her family. He said that there was a danger that his friends might see someone eating pork or drinking alcohol. The judge said that the claim of abuse was not proven. Though the concept of the abuse level needed to secure a green card is not easy to understand, in several of these cases AAO set what appears to be a high standard. Neither a citizen having a baby by another father, nor threatening to have the alien deported qualified as a high enough level of abuse in these cases. The alien's securing a statement from a therapist of some kind regarding the situation did not win cases in a number of instances. In at least one case, the fact that the citizen had been sent to prison for criminal behavior did not move the AAO reviewer. There were strong indications, though this was never dealt with as a decision-making factor, that most of the applicants were in illegal status at the time they filed their petitions; some had been here illegally for more than 10 years before they sought the marriage route to legality. This information always comes as a by-product of the decision writing, not a key part of it. The overall tenor of the decisions can only be described as depressing; the vast majority of the parties involved could not be included in the best and the brightest or the most honest. Let's turn to the demographic results of our little survey. In some portions of the American immigration system, specific nations dominate specific programs, as the Chinese do in the immigrant investor program (EB-5), as Indians do in the H-1B specialized worker program, and as Mexicans do in the two unskilled temporary worker programs, H-2A and H-2B. There was a single representative from each of these nations: Armenia, Australia, Belarus, Bolivia, Brazil, Burkina Faso, China, Columbia, Ecuador, Ethiopia, Germany, Israel, Jordan, Latvia, Montenegro, Morocco, Nicaragua, Pakistan, Palestine,9 Peru, Senegal, Sierra Leone, Trinidad and Tobago, Uzbekistan, and Venezuela. In 2014, only 9.2 percent of total immigration to the United States was from Africa, yet 31.6 percent of this particular population came from that continent. The Caribbean (including Guyana10) is somewhat over-represented, with 17.5 percent of this specialized population as opposed to 13.7 percent of the general migration population, with all other parts of the globe being under-represented among the abused alien spouses. Does this mean that Africans are more likely to file self-petitions, generally, are more likely to file bad self-petitions, are facing discrimination in the process, or is there some combination at work of two or all three of those factors? If there were more data available on the characteristics of all the four subpopulations (A, B-1, B-2, and B-3) we might be closer to answering those questions. The Center is in the process of filing a Freedom of Information Act request to secure more information on this matter. At the moment all we can say is that people from Africa seem to play a larger role in the abused spouse business than one might expect. As noted earlier, we had expected the majority of the appellants to be women, and they were, but by a slimmer margin than we would have guessed. Of 93 individuals studied, gender was available for 85; 45 were women and 40 were men. One of the possibilities is that AAO was tougher on males claiming abuse than it was on women making the same claim. Again, basic demographics on the populations of interest could shed light on that matter. The AAO decisions, much like those coming down from a magistrate's bench, are designed to take care of the instant case with as few words as possible. They are not designed to provide research data. That said, it would help if AAO would, at the very minimum always do what it does most of the time, which is to tell the reader the nation of origin and the gender of the appellant. Identifying data deleted to prevent clearly unwarranted invasion of personal privacy. Then, in bursts of crusading, puritanical non-transparency, the AAO clerks use heavy pens to delete the names of everyone involved in the case, not just that of the alien, and black out anything that might, for example, tell us the location of the case. In a few instances I have seen the clerks obliterate the name of the USCIS officer who signs the covering letter or the gender of the appellant. The assertive redacting sometimes makes it impossible to understand the thrust of a sentence. The most troublesome part of this privacy obsession relates to the names of the lawyers involved; they are never identified. This is a policy problem because it prevents anyone outside the case from gathering information on the often sloppy treatment of the AAO system by some of the lawyers whose cases are rejected for such reasons as late filing, failing to respond to questions raised in the decision being appealed, and in some case, for failing to file a substantive appeal of any kind. Don't the aliens have a right to know which lawyers handle matters badly? Don't federal court records show the names of all the lawyers in the case? Our major take-away from this little exercise is that we now have proof, in the texts of the 93 decisions, that there is no indication that citizens (or green card holders) accused of abuse have any opportunity to respond. We often hear this from individuals who married aliens, but now we have it from those who judge these cases on appeal. Divorce courts handle matters like this all the time. Why can't the federal government provide a similar even-handed treatment in cases where an alien can claim legal status because of abuse by his or her citizen (or green card) spouse? Should we be silencing the voices of our own citizens? 1 The National Oceanic and Atmospheric Administration reported that the number of people killed in the United States by lightning in the years 2010 to 2015 varied from 23 to 29. 2 David North, "Green Cards Triple in Worrisome Category – Abused Spouses of Citizens", Center for Immigration Studies blog, September 7, 2016. 3 DHS, when faced by the number one or two in immigration data, punts because of an odd sense of privacy and shows the letter "d" instead of a number. The number of arriving abused spouses in 2014, in one portion of the data, was either one or two, and DHS is not telling us which. The data are from the 2014 Yearbook of Immigration Statistics, table 7. 4 David North, "Government Statistics Paint Grim Portrait of 'Abused 'Alien Spouses", Center for Immigration Studies blog, September 9, 2016. 5 A tiny percentage of the abused spouse applicants presumably could work legally because they hold a visa, such as an F-1 for foreign students, that allows them to work, and hence they would not need to seek a work permit in their new status. The immigration status of the alien is not always mentioned in these decisions; in one case we did see that the alien had been an F-1 at the time of the marriage. 6 See, for example, Dan Cadman, "One-sided Marriage Fraud Redux", Center for Immigration Studies blog, January 12, 2016. 7 The full set of AAO decisions on this kind of case can be seen here. 8 If USCIS suspects that a marriage petition is dubious, it sets up simultaneous and separate interviews with both spouses in which the same sets of questions are asked of each party, such as "what did each of you have for breakfast this morning", "who made the coffee in the morning", "what is the color of the curtains in the kitchen", etc. 9 AAO has its own foreign policy; whereas neither the DHS Office of Immigration Statistics nor the State Department's Visa Office recognize the existence of Palestine, AAO does. That territory, incidentally, adjoins a nation spelled "Jordon" in another AAO decision. 10 I have included this English-speaking country with the Caribbean in our tabulations because its population is more similar to that of the islands than it is to that of its immediate geographic neighbors.